����� Ethnobotanical Leaflets 14: 274-305, 2010. Socially, folk medicines, mainly based on plants, enjoy a respectable position today, especially in the developing countries, where modern health service is limited. Safe, effective and inexpensive indigenous remedies are gaining popularity among the people of both urban and rural society of India. A floristic survey of ethnomedicinal plants occurring in the tribal area of Mizoram was conducted over the period of last five years to assess the potentiality of plant resources for modern treatments. The information provided in this paper on medicinal uses of plants is based on the exhaustive interviews with local physicians practising indigenous system of medicine, village headmen, priests and various tribal folks/groups of Mizoram. In this paper, 159 ethnomedicianl plant species belonging to 134 genera and 56 families recorded from tropical forests, home gardens, roadsides and University Campus of Mizoram have been described. A categorical list of plant species along with their local name, scientific name, distribution status, habit, plant part/s used and the mode of administration reported for effective control of different diseases linked with humans. Keywords: Etnomedicines; Tribals; Asteraceae; Ethnobotany; Hot spot. ��� India has rich diversity of medicinal plants distributed in different geographical and environmental conditions. Tribal people in different parts of India, use their traditional ecological knowledge (TEK), received from their ancestors and contemporary society, in primary health care. Moreover, TEK of tribals is intimately linked with geography as well as ecological and cultural factors (Gesler 1992; Wiley 2002). ��� Ethnobotany, as an application of TEK, must have been the first knowledge acquired by man to satisfy his hunger, healing his wounds and curing various ailments (Kshirsagar and Singh 2001). Ethnobotany is defined as �the investigation and evaluation of the knowledge of all phases of life amongst the primitive societies and plant environment with respect to life, customs, beliefs and history of the tribal people� (Kshirsagar and Singh 2001). Ethnomedicine, as defined by Foster and Anderson (1978), is the totality of health, knowledge, values, beliefs, skills and practices of members of a society including all the clinical and nonclinical activities that relate to their health needs. Therefore, traditional/folk medicines have inextricable link with human society. ��� Plants have been used since ancient times for the treatment of various ailments. The traditional systems of medicine together with folklore systems continue to serve a large portion of the population, particularly in rural areas, in spite of the advent of the modern medicines. Out of about 15,000 species of higher plants in India, medicinal uses have been attributed to 1500 species (Handa 1998). ��� �The traditional medical practices based on plants are an important part of the primary healthcare system in the developing world (Sheldon et al. 1997). According to the World Health Organization (WHO) as many as 80% of world�s population depends today on traditional medicine for their primary health care needs (Azaizeh et al. 2003). Safe, effective and inexpensive indigenous remedies are gaining popularity among the people of both the urban and rural areas, especially in India and China (Katewa et al. 2004). �� �Many tribal communities in India still practice use of their TEK to cure a variety of diseases and ailments (Jain and Dam 1979; Katewa et al. 2001; Kshirsagar and Singh 2001; Jagtap et al. 2006; Kala and Sajwan 2007; Sajem et al. 2008; Katewa 2009). There are a few surveys that reveal the practice of herbal medicine by the Korkus (Bhogaonkar and Devarkar 2002a, b; Padhye et al. 1991, 1992) and other tribes of Melghat area (Chaudhari and Hutke 2002). Review of literature revealed that few reports on the ethnopharmacognostic studies and the use of some plants for antisterility and urinogenital disorders are available (Bhogaonkar and Devarkar 2002a, b). Further, this plant-based TEK has become a recognized tool in search for new sources of drugs and nutraceuticals (Sharma and Mujumdar 2003). Henceforth, age-old knowledge of the plants is the basis for ethnobotanical research in India (Jagtap et al. 2006). �� �The tribes of the Himalayan region also have rich ethnomedicinal traditions for which a few literatures are available (Biswas 1956; Bennet 1983; Yonzone et al. 1984; Srivastava et al. 1987; Venu et al. 1990; Pandey 1991; Rai and Sharma 1994; Rai et al. 1998; Rai and Bhujel 1999, 2002; Das and Mandal 2003; Sajem et al. 2008). Plants and their parts are not only used as food and medicine but also used in various tribal rituals that are a part of their social and religious life (Etkin and Rose 1991; Rai 2009). �� The aim of the present study was to evaluate some medicinal uses of the plants utilized by the different tribes of Mizoram (an Indo Burma hot spot region) and encourage preservation of their culture, traditional knowledge, conservation and sustainable utilization of the plant wealth occurring in the study area. In the present paper, we report some ethnomedicinal uses in the treatment of different ailments by the tribal peoples of Mizoram, India. � �North East India (NE India) forms a significant portion of both the Himalaya and Indo-Burma biodiversity hotspots. 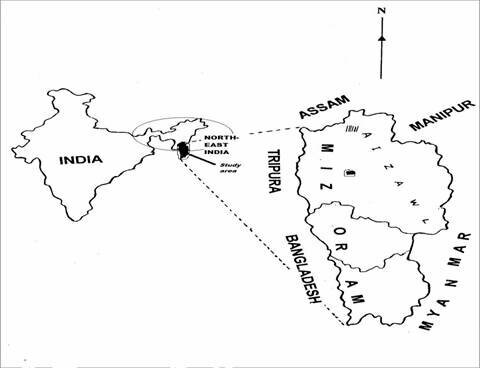 Study area, Mizoram, the 23rd state of the Indian union, covers an area of 21,087 sq.km and is sandwiched between Myanmar (Burma) and Bangladesh (Figure 1). Mizoram is an important state of North-eastern (NE) India and also is a part of the 25 mega-biodiversity hotspots of the world. The forests in Mizoram are classified as Tropical Wet Evergreen Forests, Tropical Semi-Evergreen Forests and Sub-Tropical Hill Forests. Therefore, there are varying forest types Mizoram which are of immense values to mankind. However, these forests are exposed to various anthropogenic disturbances e.g. shifting cultivation, timber logging, extraction of fuel wood by poor/rural tribals, industrialization and in fact urbanization in some parts of state like Aizawl (Rai et al. 2009). In NE India, nearly 80 percent of the population depend on agriculture, where the economy is predominantly agrarian and rural, where tribal with subsistence living constitute about 27 percent of the population and where nearly 87 percent of the population live a deprived life in nearly 43,000 villages. In the NE Himalayas, subsistence largely depends upon resources derived from natural forests due to the free and easy access to these and simplicity in their use. �� The vegetation of Mizoram, according to proposed classification, is tropical evergreen and semi-evergreen forest in the lower altitude hills; sub-tropical to montane sub-tropical in the high hills. A major portion of Mizoram�s forests are therefore tropical evergreen and semi-evergreen (Rai 2009). Fig. 1 represents the population of Mizoram and its high intensity in capital, Aizawl. It is worth to mention that in Mizoram, the number of doctors and other medical staff is very low, in comparison to the total population (ratio doctors to total population was 1:3415) (Sharma et al. 2001). Moreover, the topography of Mizoram is responsible for the under developed communication system in the state. Thus, the people of the rural areas cannot avail of modern methods of treatment and they search for remedies from nature (Sharma et al. 2001). Table 1. �Population distribution in Mizoram and Aizawl. �� The indigenous peoples belonging to different tribes were interviewed pertaining to mode of use and identification in local name as per Lalramnghinghlova (1998). Some of the �Red Listed species� documented in the study area are marked (IUCN, 2003). Although it was tedious one because the indigenous peoples are hesitant to transfer their indigenous knowledge acquired from their ancestors since the time immemorial. During last 5 years of study (2004-2008), we recorded these ethnomedicinal plants from different forest types of Mizoram, protected areas of Mizoram, home gardens, herbal gardens as well as Vanaspati Van. Assistance from other Institutes has been taken for rapid identification through the herbariums which were finally submitted to Department of Environmental Science, Mizoram University, India. �� �A total of 159 ethnomedicinal plants belonging to 134 genera and 56 families which were recorded during the study have been listed (Table 2). Asteraceae family comprised maximum number of ethnomedicinal plants (16) followed by Euphorbiaceae (9), Zingiberaceae, Clusiaceae, and Rubiaceae (7 each). Scientific name, local name, Family, their habit, survival status in Mizoram, plant parts used are mentioned precisely in Table 2. Further, mode of utilization and their specific role in curing different diseases linked with human society is also discussed. Table 2. Ethnomedicinal plants recorded from Mizoram (2004-2008). Root paste in combination is used as an effective remedy against inflammatory glands. Seed-diuretic, expectorant, febrifuge, stomachache, in bronchitis and in laryngeal & pulmonary infections. The outer skin is scraped off & applied on cuts as haemostatics. Tinospora cordifolia (DC.) Miers. Ex. Hook. Young leafs are boiled and taken orally against diphtheria; roots are boiled & the water is taken against excess bleeding. Vitex peduncularis* Wall. ex. Schauer. *Those marked by asterisk represent the plants which were recorded for the first time. � �Traditional knowledge of herbal remedy to treat human diseases is fast declining in many parts of the world, including India. Even today, tribals and certain local communities in India still practice herbal medicine to cure a variety of diseases and disorders. They collect and preserve locally available, wild and cultivated plant species. �� Bio-resources of Mizoram comprise a great share of natural resources. The agroecosystems as well as natural ecosystems harbour immense genetic potential (Lalramnghinghlova 1999b; 1999c; 2002). Lalramnghinghlova and Jha (1998) described more than 200 ethnomedicinal plants for their efficiency to cure diseases like bleeding from nose, fever, malarial fever, asthma, tuberculosis, calculi, stones in kidney, gall-bladder, urinary troubles, hypertension, diabetes, stomachache, stomach ulcer, dysentery, diarrhoea, jaundice, hepatomegaly, fracture of bone, gyneic disorder and snake bite. They added that over 60% people living in the interior parts of the state depends upon herbal medicine. Further, Lalramnghinghlova and Jha (1997) identified and hand in hand characterized the ethnomedicinal plants based on IUCN threat categories. Also, Lalramnghinghlova and Jha (1999) during their extensive survey of ethnomedicinal plants provided new records of aforesaid which has not been reported earlier in forests of Mizoram. Lalramnghinghlova (1999) marked that although more works have been undertaken on ethnobotany, very less focus has been given to ethnozoology which is very necessary in order to address ethnobiology in its totality. �� Recent decades have seen significant changes occurring within several aspects of ethnomedicine as a result of environmental degradation and tremendous changes in modern, social, and economic systems. Due to aforesaid factors, acting in concert, the traditional knowledge system in India is fast eroding. Hence, there is an urgent need to record all ethnobotanical information among the diverse ethnic communities before the traditional culture is completely lost. Often, tribals are exploited by the modern societies and they are forbidden to use the forest resources with which their lives are strongly interwoven. Policy makers should secure the TEK of tribal people, whose socio-economic life is interwoven with the forests from where they derive all their material requirements, including their healthcare needs and foodstuffs. Further, we recommend that after survey, mapping and identification we have to have some collaborative and financial cooperation extended from governmental and scientific institutions to prepare a database of medicinal plants from Mizoram and also to extract the bioactive compounds responsible to treat the ailments. The claims emanating from the present survey need to be subjected to pharmaco-chemical studies in order to explore their true potential as it is very difficult to judge the effectiveness of folk medicine. The ethnomedicinal plants, particularly threatened ones, should be cultivated in herbal gardens, agroforestry systems and home gardens to encourage their sustainable utilization and hence conservation. ��� �The authors are thankful to University Grants Commission (UGC) and Department of Science and Technology, Government of Mizoram for financial assistance to HLR. Also, HLR is thankful to Environment and Forest Department, Government of Mizoram and Professor L.K. Jha for providing all sort of cooperation during his work as Forest Botanist. The authors also extend their regard to Professor A.N. Rai, Vice Chancellor, Mizoram University, for his kind co-operation and support. Azaizeh, H., Fulder, S., Khalil, K. & Said, O. (2003). Ethnomedicinal knowledge of local Arab practitioners in the Middle East Region. Fitoterapia 74, 98� 108. Bennet, S.S.R., (1983). Ethnobotanical studies in Sikkim. Indian Forester 109, 577�581. Bhogaonkar, P.Y. & Devarkar, V.D. (2002a). Some unique ethnomedicinal plants of Korkus of Melghat Tiger Reserve (Maharashtra). Ethnobotany 14, 16�19. Bhogaonkar, P.Y. & Devarkar, V.D. (2002b). Pharmacognostic studies in some asteraceous ethnomedicinal plants of Korkus of Melghat, Distt.-Amravati (M.S.). Bhaskaracharya Research Institute�s Journal of Advances in Science and Technology 5, 28�32. Biswas, K. (1956). Common Medicinal Plants of Darjeeling and Sikkim Himalaya. Bengal Government Press, West Bengal, Calcutta. Chaudhari, U.S. & Hutke, V. (2002). Ethno-medico-botanical information on some plants used by Melghat tribes of Amravati District, Maharashtra. Ethnobotany 14, 100�102. Etkin NL, Rose PJ. (1991). Should We Set a Place for Diet in Ethnopharmacology? Journal of Ethnopharmacology 32, 25-36. Foster G. M. and Anderson B. G. (1978). Medical Anthropology John Wiley and Sons Ltd, New York. Gesler W. M. 1(1992). Therapeutic landscapes: medical Issues in Light of the new cultural geography. Social Science & Medicine 34, 735. Handa, S.S. (1998). Indian efforts on standardization and quality control of medicinal plants using scientific parameters. Amruth (The Traditional Healthcare Magazine) 2, 10. IUCN (2003). Guidelines for Application of IUCN Criteria at Regional Levels. Version 3.0. IUCN. Jagtap S.D., Deokule, S.S., Bhosle, S.V. (2006). Some unique ethnomedicinal uses of plants used by the Korku tribe of Amravati district of Maharashtra, India. Journal of Ethnopharmacology 107, 463�469. Jain, S. K., & Dam, N. (1979). Some ethnobotanical notes from northeastern India. Economic Botany 33(1), 52-56. Kala C P & Sajwan B S. (2007). Revitalizing Indian systems of herbal medicine by the national medicinal plants board through institutional networking and capacity building. Current Science 93(6), 797-806. Katewa, S.S. (2009). Indigenous People and Forests: Perspectives of an Ethnobotanical Study from Rajasthan (India) K.G. Ramawat (ed. ), Herbal Drugs: Ethnomedicine to Modern Medicine, 33, Springer-Verlag Berlin Heidelber pp. 33. Katewa, S.S., Chaudhary, B.L. & Jain, A. (2004). Folk herbal medicines from tribal area of Rajasthan, India. Journal of Ethnopharmacology 92, 41�46. Katewa, S.S., Guria, B.D., Jain, A. (2001). Ethnomedicinal and obnoxious grasses of Rajasthan India. Journal of Ethnopharmacology 76, 293� 297. Kshirsagar, R.D., Singh, N.P. (2001). Some less known ethnomedicinal uses from Mysore and Coorg districts, Karnataka state, India. Journal of Ethnopharmacology 75, 231�238. Lalramnghinghlova, H. & Jha L.K. (1998). Ethnomedicinal plants among the hill tribes of Mizoram. In: Prospects of Medicinal Plants, Eds. P.L. Gautam, R. Raina, U, Srivastava, S.P. Raychaudhari and B.B. Singh (pp. 67-86) Indian Society of Plant Genetic Resources, New Delhi;. Lalramnghinghlova, H. (1999). Ethnobiology in Mizoram state: Folklore medico-zoology. Bull. Inst. Med. XXIX pp. 123-148. Lalramnghinghlova, H. (1999). Ethnobotany: A Review. J. Econ. Taxon. Bot. 23 (1), 1-27. Lalramnghinghlova, H. (1999a). Prospects of Ethnomedicinal plants of Mizoram in the new millennium. Proc. Symp. On Science & Technology for Mizoram in 21st Century, 17-18 June, Aizawl, 119-126. Lalramnghinghlova, H. (1999b). Status paper on bamboo in Mizoram. Arunachal Forest News 17 (1&2), 34-37. Lalramnghinghlova, H. (1999c). Ethnobotanical and agroecological studies on genetic resources of food plants in Mizoram state. J. Econ, Taxon. Bot. 23(2), 637-644. Lalramnghinghlova, H. (2000). Ethnomedicinal plants development in Mizoram. Proc. Int. Workshop on Agroforestry and Forest Products, Aizawl, November, 28-30 pp. 395-404. Lalramnghinghlova, H. (2002). Bioresources of Mizoram: An overview. Journal of the North Eastern Council, 56-64. Lalramnghinghlova, H. (2002). Ethnobotanical study on the edible plants of Mizoram. Ethnobotany 14, 23-33. Lalramnghinghlova, H. (2003). Ethnomedicinal plants of Mizoram. Bishen Singh Mahendra Pal Singh, Dehra Dun. Lalramnghinghlova, H., & Jha, L.K. (1997). Forest Resources: An Overview. In: Natural Resource Management (Vol I) ed. L.K. Jha, S.B. Nangia (pp. 203-255) A.P.H. Publishing Corporation, New Delhi. Lalramnghinghlova, H., Mohan, R., & Jha, L.K. (1997). Ethno-phytomedicinal practice in Mizoram (NE India) based on indigenous classification of diseases. In Proccedings on National Conference on Health Care and Development of Herbal Medicines August 29-30, pp. 195-200. Padhye, M.D., Deshmukh, V.K. & Tiwari, V.J. (1992). Ethnobotanical study of Korku tribe of Amravati District, Maharashtra State, India. International Journal of Pharmacognosy 30, 17�20. Pandey, V.N. (1991). Medico-Ethno-Botanical Explorations in Sikkim Himalayas. Central Council for Research in Ayurveda and Siddha, Government of India, New Delhi. Rai, L.K. & Sharma, E. (1994). Medicinal Plants of Sikkim Himalayas�Status Uses and Potential. Bishen Singh Mahendra Pal Singh, Dehradun. Rai, P.C., Sarkar, A., Bhujel, R.B. & Das, A.P. (1998). Ethnomedicinal studies in some fringe areas of Sikkim and Darjeeling Himalaya. Journal of Hill Research 11, 12�21. Rai, P.K. (2009). Comparative Assessment of Soil Properties after Bamboo Flowering and Death in a Tropical Forest of Indo-Burma Hot spot. Ambio: A Journal on Human Environment 38 (2), 118-120. Rai, S.K. & Bhujel, R.B. (1999). Notes on some less known Ethnomedicinal plants from Darjeeling Himalayas. Journal of Hill Research 12, 160�163. Rai, S.K. & Bhujel, R.B. (2002). Ethnic uses of some monocotyledonous plants in the Darjeeling Himalayan region. In Das, A.P. (Ed. ), Perspectives of Plant Biodiversity (pp. 635�644). Bishen Singh Mahendra Pal Singh, Dehradun. Sajem, A.L., Rout, J. & Nath, M. (2008). Traditional Tribal knowledge and Status of some Rare and Endemic Medicinal Plants of North Cachar Hills District of Assam, Northeast India. Ethnobotanical Leaflets 12, 261-275. Sharma, P.P. & Mujumdar, A.M. (2003). Traditional knowledge on plants from Toranmal Plateau of Maharashtra. Indian Journal of Traditional Knowledge 2, 292�296. Sheldon, J.W., Balick, M.J. & Laird, S.A. (1997). Medicinal plants: can utilization and conservation coexist? Economic Botany 12, 1�104. Srivastava, T.N., Kapaki, B.K. & Atal, C.K. (1987). Ethnomedico-botanical investigations in Sikkim. Journal of Economic and Taxonomic Botany 11, 413�421. Venu, P., Kumar, V. & Bhasin M.K. (1990). Human activity and its impacts on vegetation: a case study in Sikkim Himalayas. Journal of Human Ecology 1, 27�38. Wiley, A.S. (2002). Increasing use of prenatal care in Ladakh (India): the roles of ecological and cultural factors. Social Science & Medicine 55(7), 1089-1102. Yonzone, G.S., Yonzone, D.K.N. & Tamang, K.K. (1984). Medicinal plants of Darjeeling district. Journal of Economic and Taxonomic Botany 5, 605�616.